Sarah is an experienced trial attorney, litigator, and appellate advocate. She practices law in Utah and Colorado and in the federal Ninth and Tenth Circuit Courts of Appeal. Sarah graduated from the University of Denver Sturm College of Law in 2004. She started law school at the age of eighteen and obtained her juris doctorate degree shortly after she turned 21. After serving two clerkships, Sarah joined Christensen & Jensen in 2007 and became a shareholder of the firm in 2014. 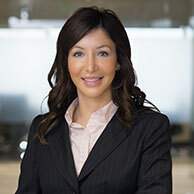 Sarah serves as lead trial counsel in all kinds of commercial and business tort cases. Her experience is broad; she regularly handles lawsuits alleging breach of contract, common law and statutory fraud, breach of fiduciary duty, misappropriation of trade secrets, unfair competition, trademark/copyright infringement, and trade dress violations, among other claims and causes of action. Sarah has successfully prosecuted and defended against emergency motions for injunctive relief and has first-chaired evidentiary proceedings in relation to such motions. She has won numerous cases by summary judgment after years of hard-fought litigation. Sarah also defends the interests of businesses that are sued for product defects, breaches of warranty, and negligence. She is very familiar with all aspects of Utah product liability law, theories and defenses. She has defended cases involving a diverse array of products such as home and RV appliances, motor vehicles, trailers, watercraft, vehicle components, exercise equipment, medical devices, window blinds, pharmaceuticals, ammunitions, farm implements, complex industrial machinery, pressurized bottles, fire suppression systems, toilets/sinks/plumbing materials, and chemical solvents, among others. She also defends businesses and businesspeople sued for negligence in all forms including professional liability, premises liability, trucking and motor vehicle accidents, and wrongful death claims. Sarah is an experienced appellate lawyer. She has been counsel of record in more than thirty appeals. Her experience includes interlocutory appeals, appeals of injunctions, appeals of summary judgment orders, and post-trial appeals. She handles all facets of appellate work. She is experienced preparing merits briefs, petitions for interlocutory appeal, motions for 54(b) certification, petitions for certiorari, and amicus briefs. In connection with her focus on appellate work, Sarah served as chair of the Appellate Practice Section of the Utah State Bar in the 2017-2018 bar year. She has been active in the Appellate Advocacy Committee of DRI (Defense Research Institute) since 2014. Sarah is currently serving as the seminar planning chair for the DRI Appellate Advocacy Committee. 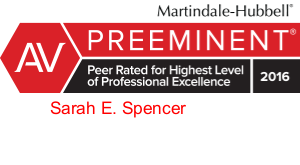 Sarah has received numerous professional accolades. She has received the highest possible AV–rating from Martindale–Hubbell since 2012. 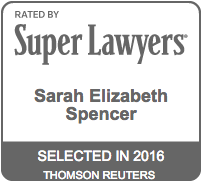 Since 2010, Sarah has been selected as a Mountain States Super Lawyers “Rising Star” and an “Up and Coming” lawyer by Utah Business Magazine’s “Legal Elite.” From 2016 through 2018, Sarah’s peers selected her for inclusion in “The Best Lawyers in America” in the practice area of commercial litigation. In 2017, Utah Business Magazine named her one of Utah’s “Forty under 40” young professionals. Defended manufacturers from product liability claims in a variety of consumer goods, vehicles, and drug/medical devices. Appointed as a representative on the Utah Appellate Roster by the Utah Board of Appellate Court Judges for Criminal Appeals and Juvenile Delinquency Appeals as of December 5, 2018 for a two-year term. Author: "Is the Record Really Complete?" published by the National Foundation for Judicial Excellence, Volume 3 Issue 1 June 6, 2018. Speaker and moderator, DRI Trial Tactics and Appellate Advocacy Seminar joint session, Mock Oral Argument Regarding a Sports Gaming Case, March 15, 2018, Las Vegas Nevada. Author, “How Appellate Courts Consider New Evidence on Appeal,” published in For the Defense, February 2017.